Hold these dates to hang your hat with us at a very historic downtown hotel! The 2016 Poindexter Family Reunion is returning to Texas! Yes, Texas. The last time we met in Texas was in 1996 and we were in the city of San Antonio. Yes, San Antonio, we’re back! Has the city of San Antonio changed since then? Yes, it has! Come join us and discover our family Heroes, Cavaliers & Frontier Folk! 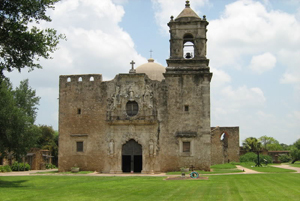 San Antonio is a city that is based on heroic stories. The most famous, of course, is the Alamo and easily within walking distance from our hotel. During this reunion you will have the opportunity to explore missions, get acquainted with cousins you may have never known existed, reacquaint yourself with cousins you may have lost touch with, and of course, there’s the restaurants! Oh, the cuisine San Antonio has to offer! Of course if missions and restaurants don’t interest you there is always a stroll down the Paseo de Rio (otherwise known as the River Walk, see picture at left). 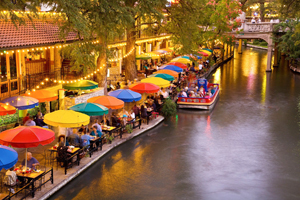 The San Antonio River Walk is now a 15-mile treasure that connects the city to its historic roots while setting it toward the future. Should you want to give your feet a rest from walking, then hop on a colorful Rio Taxi and take a leisurely trip down the river. While on your river trip, if you are lucky you might even get to cheer when a couple says “I do” on Marriage Island. There are points of interest as old as the Alamo and as new as the revitalized Pearl. Make a vaction of your visit by coming prior to, or staying after, the reunion. Check out our suggestions on the Vacation page. Be sure to return from time to time and see what new items your reunion host committee has added. Even though we are in a digital age, we will also have a Welcome Pack when you arrive that will include maps, areas of interest and anything else you might want to see in San Antonio. Make your hotel reservation and stay with us at the historic Sheraton Gunter in the heart of downtown San Antonio and one block from the River Walk. Register for the Reunion. The registration form and everything you need to know is in this web site and in the PDA Newsletter. This web site also has airport information, directions and weather information.